PHILIP BARKER watched his first big football match on February 22 half a century ago. How time flies. Fifty years on, it has come as rather a shock to discover that the first big football match I saw in person was considered a bit of a dud. 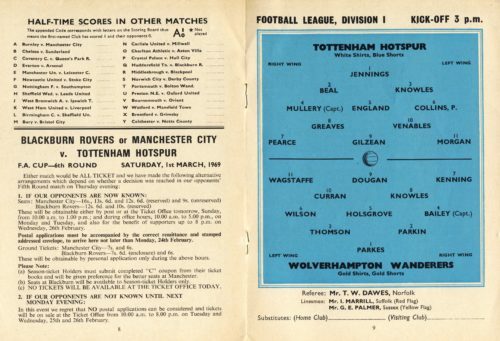 Tottenham Hotspur drew 1-1 Wolves this very week in 1969. I cannot claim to remember every detail. Happily, there were some notable writers in the White Hart Lane press box that day to fill in the gaps. Peter Dobereiner, better known for golf writing, and Steve Curry, was there early in his career for the Daily Express. Squeezing in alongside them was SJA President Patrick Collins, then writing for the News of the World. Poor weather around the country meant this was one of only three first division games to survive. All kicked off at 3pm on a Saturday. There had been heavy snow during the week and the pitch was heavily sanded but there was “surprising spring sunshine,” said the Tottenham Weekly Herald. There were no technical areas then and managers in those days were not given to theatrical gestures, especially Nicholson, who I’m told by an impeccable source, did not budge from his seat, directly below the press box. Yet it had all seemed so promising. The BBC had even selected the game for Match of the Day. There had been sound editorial reasons. Tottenham had just signed Roger Morgan from Queen’s Park Rangers. This was to be his home debut. In 1969 that kind of money would have paid for 22 comfortable houses, 22 Rolls Royces, 75 mink coats or 100 round-the-world cruises in a luxury liner. The Midland press contingent were adamant that Wolves should probably have won the match quite easily. Wolves even hit the bar, a detail I’d quite forgotten. Then again, seven-year-old eyes tend to see things rather differently. On the train journey to White Hart Lane, it was all about peering out all the way from Bruce Grove to catch sight of the floodlight pylons. 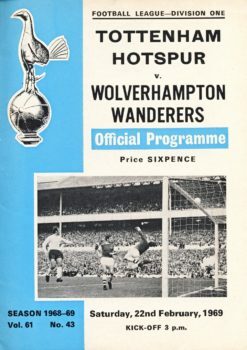 The 16-page programme cost a tanner, (2 ½ pence) “Wolves always provide attractive opposition and we can expect a stern tussle this afternoon,” was typical of the incisive content on offer. Wolves were described as wearing gold (even the shorts). Think Kylie Minogue’s outfit for ‘Spinning around’ and you’ll get an idea of the colour, and for that matter the length. The programme listed the other fixtures and assigned each a letter. Then at half time a member of the club staff would arrive with numbers and these were placed under the appropriate letters on the perimeter fencing. Thus Match B (1×0) meant Chelsea were leading Sunderland by a single goal (though Bobby Tambling ran riot in the second half scoring four goals). Whilst my father, David, and his brother John stood a few rows back, a stool was passed down to add vital extra inches to see over the fence, a ringside view from the ‘Shelf’. For all its shortcomings, it was still a magical experience and the beginning of a life-long love of the big sporting occasion. When it appeared on TV it was “a match edited into instant delight for television viewers,” Ian Archer in the Daily Mail. To this day I’ve never seen the TV coverage. Perhaps they could replay it on Match of the Day this weekend if one of the Premier League matches turns out to be less than scintillating.